The Camino is known in English as the Way of St James. All Camino pilgrimage routes lead to Santiago de Compostela as this is where the remains of St James, (Santiago), were discovered in the ninth century. The pilgrimage was popular in the 10th, 11th and 12th century and then slowly declined in popularity. By the 20th century, almost no one was walking any of the routes. Then in the late 1970’s and early 1980’s the route became of interest to a few. They began to write and map the routes again. In the 21st century, the idea of a pilgrimage is perhaps quaint. However, the exertion of walking for a month and being disconnected to modern devices is immensely liberating. I walked the Camino in 2004, 2005, and 2012. Each time it was different. Many go back and walk the same route again, or a different route. Some pilgrims are unable to take enough time off to walk a whole route and walk for a week each year finishing their Camino over 4 or 5 years. It is your Camino – do it whatever way you want. The Camino Frances is by far the most popular and well known of all the Camino routes. It starts at St Jean Pied de Port and runs the breadth of Spain to Santiago. The Camino Portuguese is the second most popular pilgrimage route on the Iberian Peninsula. The full route starts in Lisbon, but most prefer to start at Porto. I would say the Camino del Norte is the most beautiful of all the Camino routes, and maybe the toughest in Spain. 825km of rugged coastline – bliss. At only 261 km the Camino Primitivo or Camino Original as it is also known can look like a breeze. But, it is a tough hilly 261km – it is wonderfully quiet. The route to Finisterre is referred to as a Camino, but it does not lead you to Santiago – rather it leads you to the coast and the end of the world. A great circular route. The shortest of all the Caminos, the English way starts on the north coast at Ferrol or A Coruna. But, still, more than 7,000 walk this each year. returns results from the Camino Forum and this website. Click on the map to the right, and it will expand to the full page. These pages are intended to help you plan your pilgrimage, and hopefully, keep you in contact with other pilgrims after you have gone back to your daily life. The best place to start on the site is the Camino Routes page as there are quite a few routes. Once you decide on your hiking route you can start to plan. What is the Best Time to Walk the Camino? 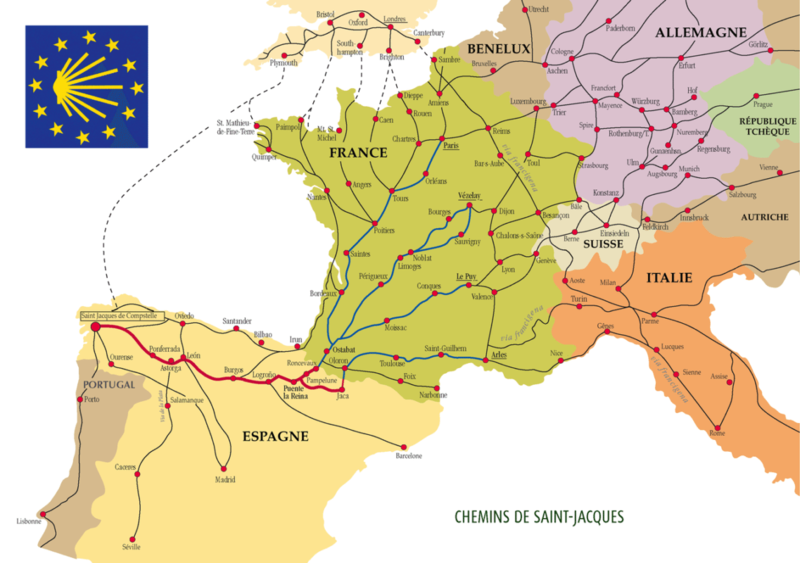 During June and July the Camino Frances is very busy, the others routes are better. But, if you can choose when to go spring and autumn are the best. How Long is the Camino? You can start anywhere along the routes and custom your pilgrimage to suit the time you have. All the route lengths are on this page, along with common start points. If you intend to stay in pilgrim accommodation or collect a Compostela in Santiago you will need a pilgrim’s passport. There are many places at home and in Spain. Best Start Point for One Week on the Camino? Many pilgrims will walk for only one week, and then maybe come back and pick up where they left off. These are the best one-week start points. Best Two Weeks on the Camino? Two weeks is a decent amount of time to walk and it gives you lots of choices. Here are the best start points on all the routes. It is easy to spend little on the Camino and just as easy to spend a lot. The biggest costs are food and where you decide to stay each night. Welcome to the Camino de Santiago our aim is to help you with all the information you need for any of the Camino routes. The most popular Camino pilgrimage route in Spain is the Camino Frances; this route starts in St Jean Pied de Port, France. It is the busiest and best-supported route. Santiago de Compostela is the destination for all the Camino routes; you can walk, cycle, or even ride these walking paths. Most pilgrims walk and plan and organize everything themselves. This is where we can help – we are not a tour company – but we pass on our experience of walking, how hard it was, what walking gear we needed and how fit we had to be before setting out – see all the frequently asked questions. Camino Guide Books for a list of good books, Packing lists for essential advice about feet, good boots and how little to pack, Albergues (hostels) – explains what they are and provides a full list, Travel – how to get there and back often a bit of a challenge, and Photos to give you a bit of a taste of Spain. This section is a new addition. I expect it will never be finished as I keep getting sent questions that I would never have thought of. If you have any other questions on the Camino de Santiago, just go to the forum and post them there. The Camino de Santiago is for everyone, young, old, fit, unfit, religious or otherwise. One of the surprising observations I had was that people I thought would drop didn’t – and most of the people I saw with problems were younger people – perhaps trying to push their walking too fast. One great bit of advice I got was – slow down – a Frenchman I met kept telling me this – I listened after a while and traveled as far, but with much less pain and strain. I have just published my guidebook on the Camino Frances. You can read more on the book page. I have a request of pilgrims walking or cycling the Camino de Santiago. Keeping this site up to date is a must, a few pilgrims email me information on new hostels and I add them to the list. My request is this – if you can send me by email, (caminoadventures@gmail.com), or post any information you collect along the way about new Albergues – Refugios – Hostels or anything else you think should be included for information for other pilgrims. Scan and email would be easiest or email me and I will send you my postal address here in Ireland. Get used to the sound – Buen Camino – it can be a beautiful journey. In 1985 2,491 pilgrims completed the Camino. In 1995 there was 19,821, then in 2005, there was 93,921.